22kt Gold Temple Necklace and Earring set (2 in 1). 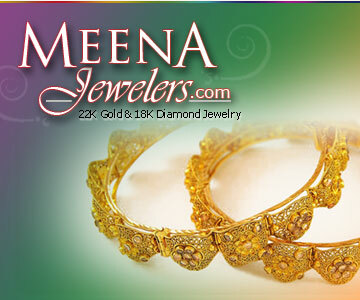 Set is beautifully designed in Antique finish in a unique pattern with studded Ruby, Emerald, and cubic zircons. 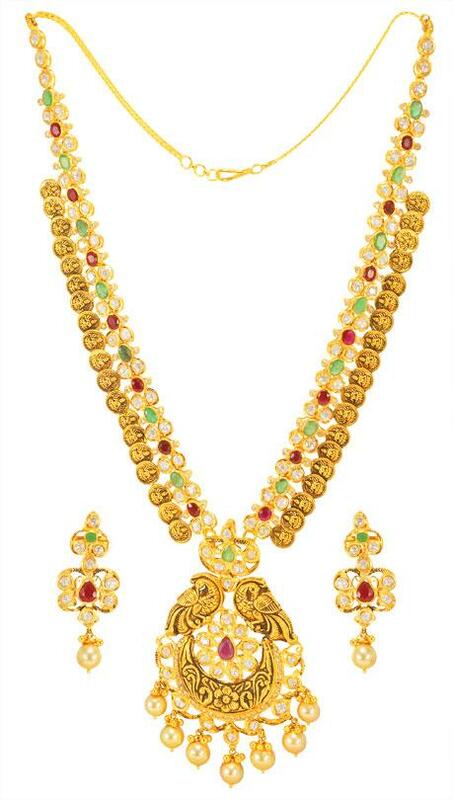 Necklace chain also has gini which is embossed with Goddess Laxmi Ji sitting on a Lotus flower. Necklace pendant has two peacock designs at the sides in combination with cubic zircons stone and hanging ghughris and south sea pearls which adds beauty. Necklace Pendant is removable and can be worn seperately. Pendant can Slide through a chain or a tassel. Necklace is 22 inches long adjustable. Center pendant is 90 mm long and 50 mm wide. Earrings are 53 mm long and 20 mm wide.